The iPhone remains a popular item for thieves, and if you steal a car with one in it, you may get caught with "find my iPhone." All this in more, in the latest Apple-related crime roundup. An attempt to rob a Berkeley, Calif., Apple Store by crashing a U-Haul truck through the front doors failed back in mid-December when the crash triggered the store's alarm system. According to KRON, the attempted theft took place at 3:30 a.m. on December 13. But the alarm went off almost immediately after the crash, and the driver had fled the scene by the time police arrived. Speaking of the California Apple Store theft ring, one of the accused thieves has reportedly been set free. 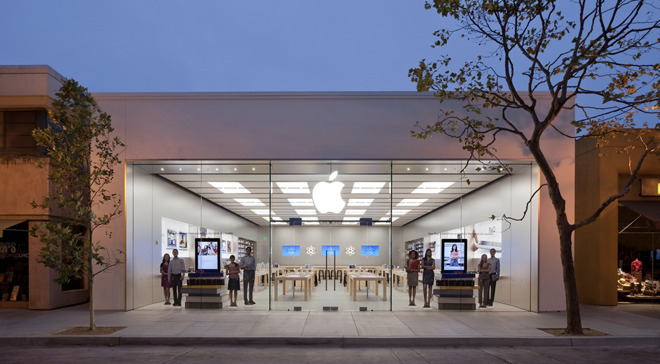 According to the Bay City News Service, one of those arrested for last year's September theft at the Emeryville Apple Store, received probation and is now free. A Montana man is accused of stealing an iPhone X from a local wireless store, and then returning to the same store two days later to attempt to activate the phone. According to the Montana Standard, employees recognized the man, took the phone back, and called police. He was arrested a few weeks later when police saw him "yelling and screaming" on an area street. A man in England who has dubbed himself "Mr. Christmas" is accused of stealing a woman's iPhone. According to The Sun, 61-year-old Andy Park was hired to a DJ a woman's birthday party. After the phone went missing, the woman used Find My iPhone to track the phone to Park's home. Park, described by the newspaper as a "festive fanatic," is a minor local celebrity for his elaborate annual holiday celebrations. He has admitted to the theft. A "granny" in Ireland bought an iPhone 6 at a market for just 10 euros- the equivalent of $11.40 - and has been convicted of theft after the iPhone turned out to have been stolen. According to the Herald, the woman was "naive in the extreme," according to her lawyer, but didn't know the phone was stolen. In other news, local criminal steals what he thought was iPhone, turned out to be Samsung Galaxy, criminal gave it back. I wonder how the market for LOJACK is doing these days now that any smartphone can do what LOJACK does. Ok, bear with me on this...you take, say, 10 islands in the Aleutians. The first island is for petty criminals, all the way up to the number 10 island that is for capitol crimes. Food stuffs are airdropped by plane and the surrounding water is 'chummed' to attract great white sharks or orcas. You move all criminals in the US to the appropriate island. Get an appendicitis or some other ailment? No problem. A doctor convicted of Medicare fraud can kayak over and perform the operation. That's so hilarious. The selfie taken thief is classic. Theft of less than $950 is a misdemeanor in California. As long as you are careful about what you take at an Apple store, all you get is a parking ticket. This has lead to groups of theives each taking one item under the limit so they are pretty much immune to any punishment.